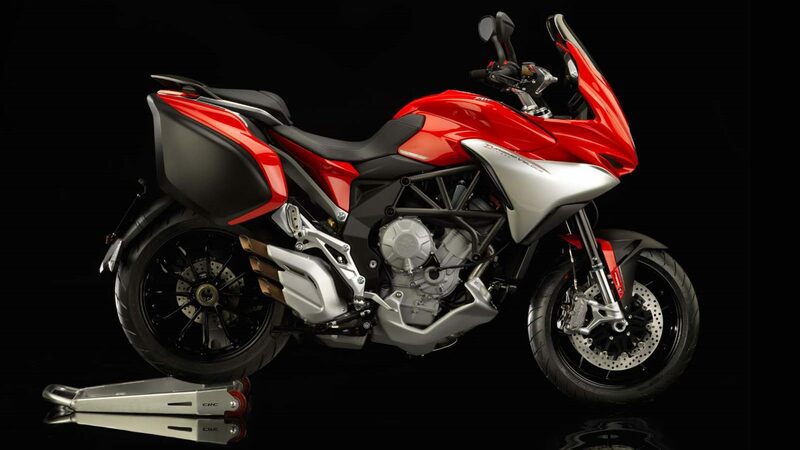 The Turismo Veloce celebrates the unique pleasure of Grand Tourismo with two models of MV Agusta: the first for travelling through time and space with the feeling of agility that only a complete but essential motorcycle can provide. The second is the Turismo Veloce Lusso whose very name suggests things that seem to have been forgotten in time. Lusso stands for an extraordinary level of accessories and technical solutions which include the innovative MVCSC system (MV Agusta Chassis Stability Control) electronic stability control through the use of semi-active suspension, less bulky saddle bags which nevertheless can carry an astounding 60 litres and the new generation MVICS 2.0 (Motor & Vehicle Integrated Control System) inertial platform which includes the up&down EAS 2.0 electronic gear change system as well as the Anti Wheelie System. These features have never before been offered to a Touring bike. The standard equipment also includes an immobiliser, heated handle grips, Bluetooth connection and integrated GPS. layout of the three exit exhaust pipes. Max. power – r.p.m. (at the crankshaft): 92 kW (125 hp) at 11.600 r.p.m. Max. torque – r.p.m. : 84 Nm (8.6 kgm) at 8.600 r.p.m. (Motor & Vehicle Integrated Control System) with three injectors. Engine control unit Eldor EM2.0, throttle body full drive by wire Mikuni, pencil-coil with ion-sensing technology, control of detonation and misfire. Torque control with four maps. Traction Control with eight levels of intervention. Gear ratio: First gear: 13/37, Second gear: 16/34, Third gear: 18/32, Fourth gear: 19/30, Fifth gear: 21/30, Sixth gear: 22/29, Final drive ratio 16/41. Alternator: 450 W at 5000 r.p.m. diameter, with steel braking disc and flange. Rear brake: Single steel disc with Ã˜ 220 mm (Ã˜ 8.66 in.) dia.